We have a rich palette of geology, landform, vegetation and land use in the Park. Individually and collectively these characteristics combine to give the National Park its outstanding scenery and special places. The dramatic, glacial topography of mountain, corrie and glen, the swathes of open heather moorland, the great forests of pine and birch, and the broad straths of farmland and settlement stretching back into prehistory, together create a landscape which has held firm in the public imagination since the days of Queen Victoria. It is a landscape of great variety, with distinctive landforms, wildlife, colours and textures, and, equally important, containing less tangible qualities such as the evocation of wilderness, naturalness, remoteness, cultural continuity and recreational exploration. Its appeal is undiminished by familiarity through books, calendars, postcards and shortbread tins because the underlying force and grand scale of nature dominates and bestows a distinct, aesthetic beauty; and because the infinite variations in colour, atmosphere and weather mean the landscape rarely looks the same, even on consecutive days. Humans feel small in such a vast landscape of wide panoramas. Six out of seven of Scotland’s highest peaks are found here, and the mountain core stands sentinel over the whole area. 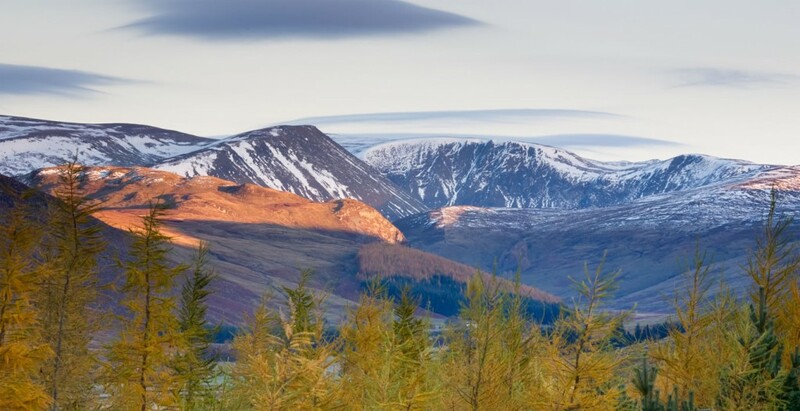 The corries and glens are large and dramatic, and the wide, high plateaux are more expansive than any others in Britain. Open, rolling heather moorland covers great tracts of land, woodlands are extensive and the straths are on a grand scale, hosting majestic rivers. A journey through the Park reveals many strong contrasts in an ever-changing array of surprise and visual delight. These include the sight of intimate, village gardens against a backdrop of snow-clad peaks; high, exposed mountains glimpsed through sheltered trees, or seen rising above fertile farmland; green pastures adjacent to heather moorland; heather intimately mixed with beautiful, ancient pines, or cladding the open hills in large swathes; rolling hills a short distance from enclosed glens; steep slopes ending suddenly at flat glen floors; a smooth, undulating plateaux abruptly falling away to dramatic cliffs; high, mountain corries a short walk from a road; a designed, ordered landscape set amongst wild hills. The landscape tends to be horizontally stratified, ascending to the summits in a series of layers: from a meandering river, through a strath of settlement and farmland, through rough pasture, wood pasture, wood and forestry, to moorland with its patchwork of muirburn, and eventually to the high, corrie-fringed mountains. Within the landscape there are also layers of time-depth, with traces of past land use stretching from present day back into prehistory. This is a landscape of curves. The hills and peaks are rounded with long, undulating, smooth ridges, and the plateaux are gently convex. The moorland is rolling. Corries and glens, scooped out by past glaciers, are concave. At lower levels glacial moraines create hummocky, rounded landforms. The straths are gently profiled, and the rivers along the floors are wide, meandering and sinuous. 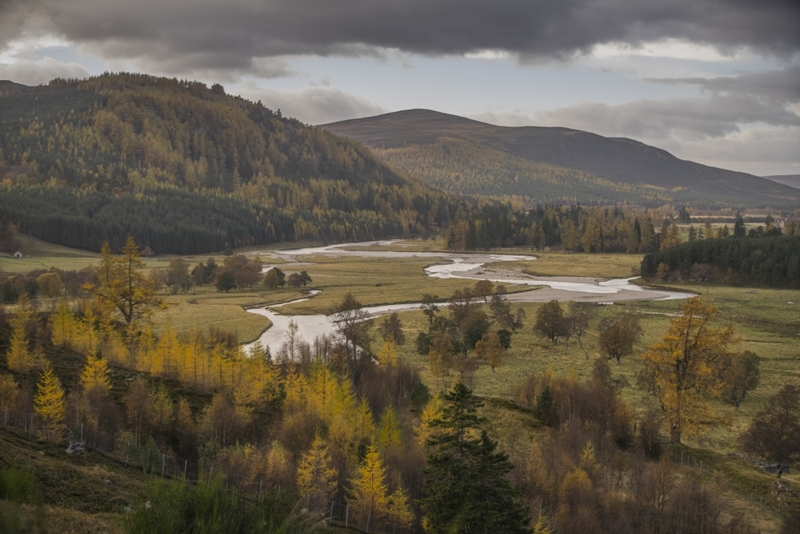 The curves of the National Park present a contrast to the more angular landscapes found in the western Highlands. At the lower altitudes the land has been long-inhabited, with patterns of land use, settlement and transport derived from the primary industries of farming, forestry and field sports. In contrast, the highest ground comprises uninhabited wild land of moor and mountain, with the greatest extent of natural vegetation and landform in the British Isles. Hence within this large area can be found both cultural landscapes, with a rich history of human occupation, and natural, wild landscapes under the dominion of nature.